:?Wilson sounds a clarion call among Christian men that is pointedly biblical, urgently relevant, humorously accessible, and practically wise.? ? 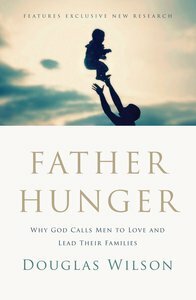 Richard D. Phillips, author of The Masculine Mandate: God's Calling to Men ?Father Hunger illustrates one of the greatest influences or lack thereof on the identity of a man: a father. Read a book that will strike an invisible chord in the lives of men both lost and found.? ? Dr. Eric Mason, pastor of Epiphany Fellowship, Philadelphia Fatherlessness is a ?rot that is eating away at the modern soul,? writes Douglas Wilson, and the problem goes far beyond physical absence. ?Most of our families are starving for fathers, even if Dad is around, and there's a huge cost to our children and our society because of it.? Father Hunger takes a thoughtful, timely, richly engaging excursion into our cultural chasm of absentee fatherhood. Blending leading-edge research with incisive analysis and real-life examples, Wilson ? Traces a range of societal ills ? from poverty and crime to joyless feminism and paternalistic government expansion ? to a vacuum of mature masculinity ? Explains the key differences between asserting paternal authority and reestablishing true spiritual fathering ? Uncovers the corporate-fulfillment fallacy and other mistaken assumptions that undermine fatherhood ? Extols the benefits of restoring fruitful fathering, from stronger marriages to greater economic liberty Filled with practical ideas and self-evaluation tools, Father Hunger encourages and challenges men to ?embrace the high calling of fatherhood? and become the dads that their families and our culture so desperately need them to be. About "Father Hunger (Unabridged, Mp3)"
Customer Reviews For "Father Hunger (Unabridged, Mp3)"
I expected a "normal" parenthood book from this, but what I got was so much more. This book really goes to the heart and shows me that many of the world's problem is due to the neglect of fathers and how children and adults still crave for fathers. We live in a culture where the absence of fathers are considered normal but the damage of this fatherless culture is so damaging. It really is a wakeup call for fathers everywhere.